Styled and finished to your specifications, we aim to create a beautiful wedding cake for you that not only looks stunning but tastes great too. We pride ourselves on perfection and our on trend elegant designs. We have a menu of delicious and interesting flavours which are usually a talking point for guests. We will work with you to develop a cake or cake table that is made up of flavours and designs that are reflective of your personal likes and your story as a couple so far. Beautiful buttercream cakes are our thing here, they provide a look of ‘natural beauty’ more so than fondant iced cakes (and they taste better too!). We steer clear of fondant icing but we can offer it if you want a certain look that cannot be achieved using buttercream. 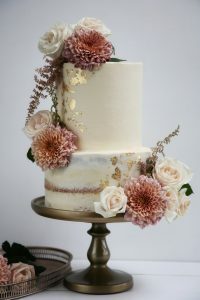 Louisa has mastered the skills in creating various textures and finishes using buttercream. We can cater for a variety of dietary requirements and will work alongside you to ensure that each and every one of you and your guests needs are met. Gluten free, dairy free or vegan – everyone can enjoy a sweet treat on your big day. • The thematic style of the table – ensuring that it is in keeping with the wider vision for your big day. We have our own selection of unique cake stands which can be hired for your big day. • Any props involved in the styling of the table – we can even source these for you if you like. 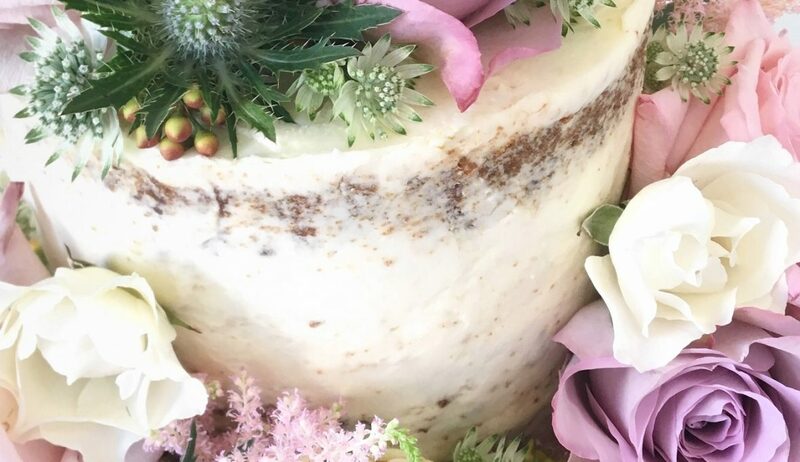 • Any flowers that would be required – you can either ask your florist to provide these or we will make a note of just what you want so that we can source them for you. 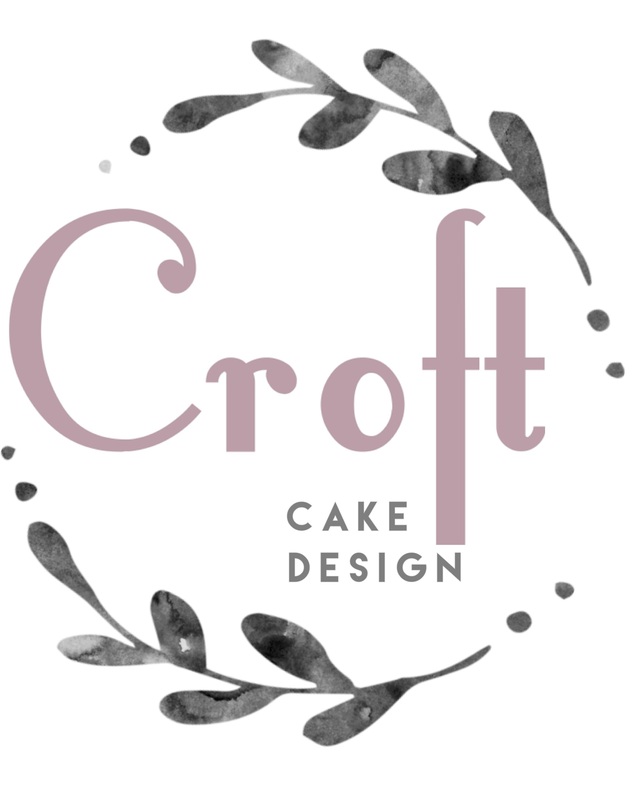 Our consultations are usually done by email or by phone, this allows us the time to be baking up all your wonderful designs. We only take on a limited amount of orders to allow us the time to give each cake the attention it deserves so we recommend you contact us to reserve your date as soon as possible. To secure your date a non refundable deposit of €100 is required. We provide a sample box service that runs approximately every 4/5 months. Boxes contain samples of 6 of our most popular sponge cake flavours and a sample of our chocolate biscuit cake, boxes are posted out by next day delivery and can be purchased for €35. Click to see our full menu of delicious unique flavours here. Contact us to book in for our next sample box service, boxes are limited and are very popular! 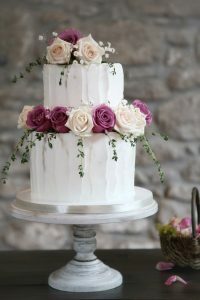 Due to the fragile nature of wedding cakes, most people choose to have their cakes delivered to the venue by us, we charge a standard set up fee of €25 for all cakes and delivery charges are calculated on distance. Here are some of our more local wedding venues and typical delivery charges. Ballybeg House, Ballinglen Wicklow – FREE delivery. Brooklodge hotel and Spa, Aughrim, Wicklow -€15 delivery charge. Lisnavagh house, Rathvilly, Carlow – €10 delivery charge. Mount Wolseley, Tullow, Carlow – €15 delivery charge. Kilkea castle, Castledermot, Kildare – €20 delivery charge. Clonwilliam House, Wicklow – €25 delivery charge. Rathsallagh House, Dunlavin, Wicklow – €25 delivery charge. Woodford Dolmen hotel, Carlow – €30 delivery charge. Martinstown House, Kildare – €40 delivery charge. Borris house, Carlow – €40 delivery charge. Step house hotel, Carlow – €40 delivery charge. Seafield hotel, Ballymoney, Wexford – €40 delivery charge. Marlfield house hotel, Gorey – €40 delivery charge. Tinakilly House, Rathnew,Wicklow – €45 delivery charge. Killashee House Hotel, Naas – €45 delivery charge. Trudder Lodge, Wicklow – €45 delivery charge. Kippure Estate, Wicklow – €50 delivery charge. Druids Glen, Wicklow – €50 delivery charge. Powerscourt, Wicklow – €50 delivery charge. You are welcome to have someone collect your wedding cake from us but we don’t recommend this for various reasons, the vehicle needs to be air-conditioned, there needs to be enough space in the boot for the cake to stand safely on a flat surface, not on a seat! Please also remember, transporting and setting up a wedding cake at a venue can take valuable time out of your special day. Understandably, if cakes are collected we cannot be responsible for any accidental damage caused after they have left our premises.